Using an HMDI Switch or Splitter is a great way to take the signal from one device such as a cable box or Blu-ray player and share it on multiple screens. A splitter would be used to take only one signal and split it to show on from two to up to sixteen TV’s. A switch would be used to have multiple devices connected, and a switch would give the capability to switch between which signal devices to send to the one TV connected. The standard HDMI cable is exactly what you'd expect. 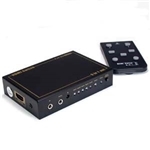 It carries high-definition video and audio from a source device to the monitor, TV screen, projector or similar display solution. The name says it all here. The standard HDMI cable with Internet does everything that a standard HDMI solution - carrying HD video and audio between devices - while also serving as an Ethernet connection between those two devices. 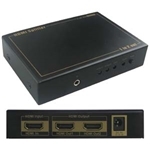 It is important to note that the devices at both sides of the connection need to be equipped with HDMI Ethernet Channel ports to make the solution work. This HDMI cable is designed to meet the unique signal requirements in automotive vehicles. 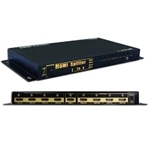 These wires do not feature Ethernet functionality, but do handle audio and video transmission. This is the cable to use when you want to support 4K resolutions, 3D movies or similar advanced features. The high speed HDMI cable is built to support these advanced technologies as well as deep color functionality. Like before, the name tells you what you need to know. High speed HDMI cables with Ethernet provide everything you want from a high speed HDMI cable, but also give you the dedicated data channel. The HDMI standard has been built with common-sense nomenclature, making it much easier to know what you are getting into when you invest in a cabling solution. At the same time, the diverse solutions on display within the HDMI framework are making the technology a cable of choice for a wide range of technology deployments.